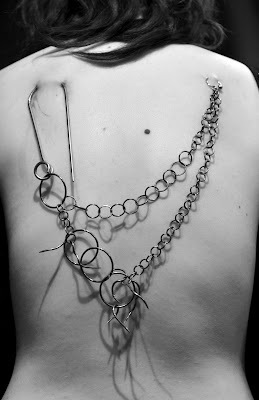 Experiential Jewellery 2008 is my graduate project. Made with sterling silver, and surgical steel. Photography & suspension hook courtesy of Nic Fletcher. Worn by myself and fellow jeweller, Gillian Deery. Once the body’s borders are determined by the individual; cold, prickly jewellery becomes a device. Challenging sensory boundaries whilst integrating the body & object with the mind. The film footage of this project was shown in Best in Show 2009 at Objectspace Gallery in Ponsonby.